The many tectonic plates that make up the surface of the Earth giving us mountains, earthquakes, volcanoes, coastal plains, seamounts, mid-ocean ridges and other features are tied to flow in the deeper mantle. 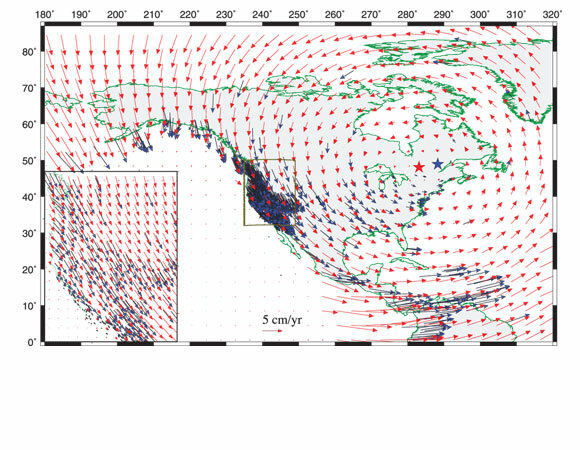 Global GPS measurements show how the plates move relative to one another and these models can be compared to global dynamic models of mantle flow. 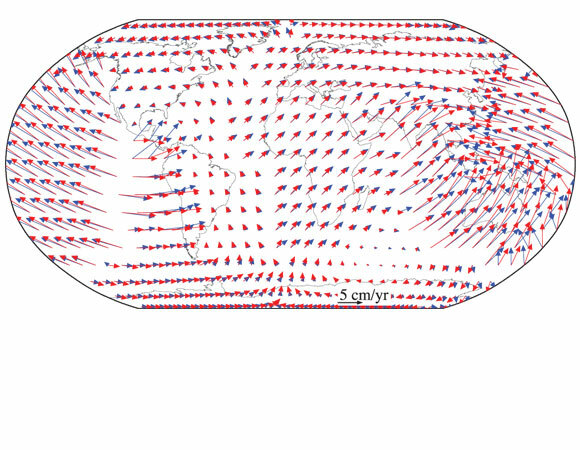 Model comparisons show that on average the plates are pretty rigid, most of the deviatoric stress is due to mantle flow and in some regions, such as western North America, the mantle flow is trailing the plate motion causing resistance along the plate boundary. The tectonic plates on the surface of the Earth are defined by surface observations, such as global GPS measurements of their relative movement, and subsurface observations, such as seismic waves that probe the bending and subducting of some plates beneath the surface. Plate motion is coupled to mantle dynamics as the mantle convects and couples to the outer fluid core and inner solid core. The authors have solved the force balance equations for the whole Earth using topography and crustal density structure plus a mantle convection model. Their model yields stresses and motions for the tectonic plates that can be compared to other models. 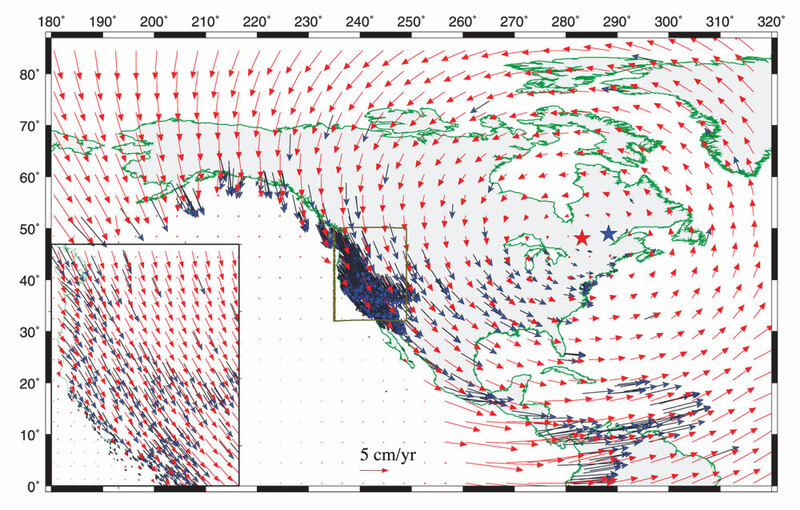 The global model shows that the plates are pretty rigid especially where the oldest rocks are concentrated into cratons, while the plate boundaries are more fluid, especially where plates are subducting beneath other plates (Figure 1). 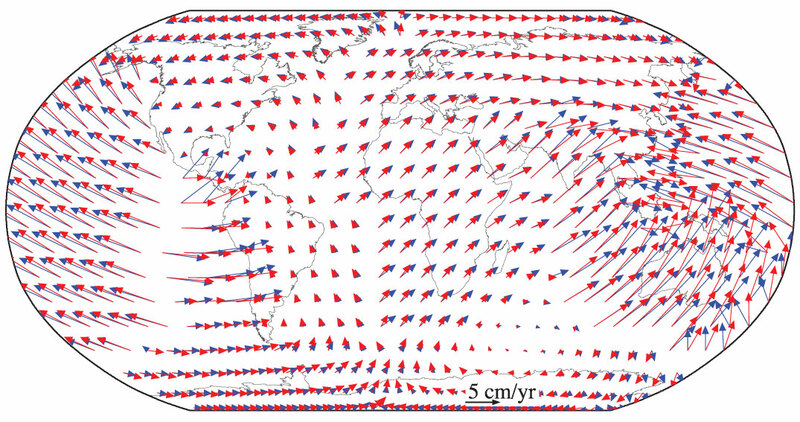 The global model of plate motions is similar to plate motions derived from global GPS measurements (Figure 2), which supports the theory that most of the plate motions are driven by mantle convection. The model shows, however, that topography and crustal density variations do contribute to plate dynamics in a significant amount that cannot be ignored. There are some regions, such as western North America where mantle flow is trailing plate motion, so that there is resistance to the plate motion by the mantle. These results are useful for understanding plate tectonics and the origins of earthquakes, volcanoes and other dynamic features on the Earth’s surface.